Why Choose a Custom Trade Show Exhibit? When you’re exhibiting at a trade show, visibility is everything. Trade shows are crowded, busy environments in which most attendees don’t always have the opportunity to spend time in every booth. Even if they do visit every booth, they are certainly not going to remember every brand they see during the event — most trade show attendees will only be able to clearly recall a handful of businesses they’ve seen at an expo. This only stresses how important it is to make your mark and proudly display everything that makes your brand wonderful. With a custom trade show booth, you can present your business exactly the way you’d like to. By designing your own custom trade show exhibit with the help of an industry professional, you are helping your brand stand out from the crowd of other exhibitors and maximize your results. Custom exhibition booths give you a high level of control over your booth’s design, layout, and features. From booth furniture to messaging, unique booth elements and other features, you have total control over how your booth looks and feels. The end result is a smarter, better looking and more effective trade show exhibit that lets you stand out from the crowd, attract attention and generate a higher return on investment from any trade show, convention, or event. Want to get the most from your next trade show? You’ll probably want some eye-catching features and innovative design, as well as on-brand details that customers can only find in your booth. Well designed, clearly branded trade show exhibits can have a huge, measurable impact on your results from a trade show or industry event. From attracting more attention to generating a higher number of leads, building a custom trade show exhibit lets you gain a significant advantage over your competitors — one that can translate into a higher return on investment. Our custom trade show exhibit design service lets your business gain an edge, helping you attract more attention, generate more leads, make more sales, and achieve a higher ROI from your next trade show. From small 10’x10’ booths to large exhibits, we can design and manufacture a massive range of customs exhibits. Our team works with businesses of all sizes, from startups to enterprise businesses and established brands. 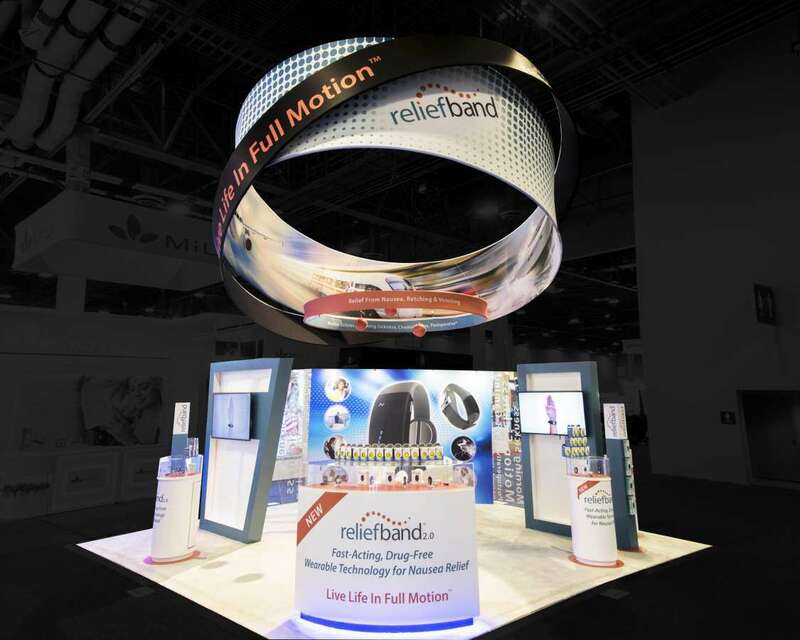 Ready to turn your custom trade show exhibit idea into a reality? We’re ready to guide you each step of the way. 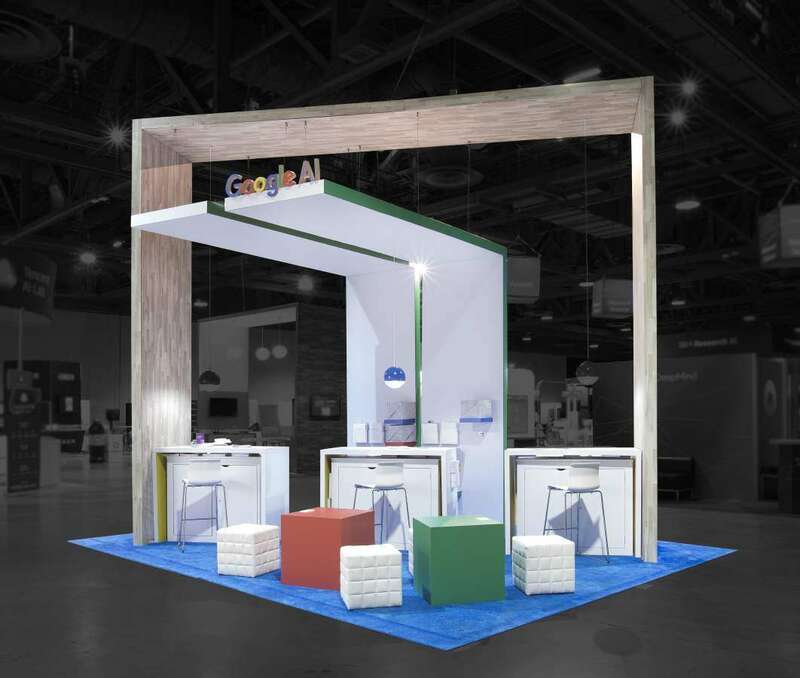 Exponents offers customers a complete custom exhibit design service for booths of all sizes, layouts, and types, letting brands create a booth that’s completely unique to their business. Our approach to custom trade show exhibit design is simple: We turn your concept into a custom exhibit for your next convention or trade show. Your custom show booth will help your business stand out, attract attention and achieve all of your marketing objectives. Displaying a custom exhibit offers a number of benefits for your business. For one, you’re able to take advantage of a wider range of booth sizes and layouts than what’s possible with pre-designed rental booths, letting you present your business in your own unique way. 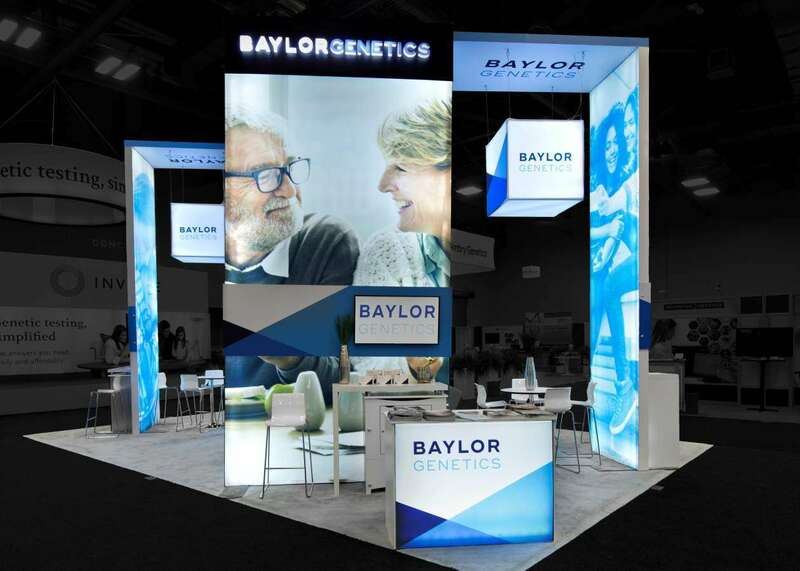 Another advantage of custom trade show exhibits is the ability it affords brands to let their display shine through the use of custom signage, technology, booth furniture and more. This added flexibility allows for specialized display design that suits the client’s needs first. After all, when you are demoing your latest product, it’s important to provide a comfortable environment to talk to customers. Our custom trade show exhibit design process begins with a chat with our staff about what you need from your custom trade show exhibit design. Using your concept, we’ll prepare a detailed model of your booth using advanced 3D rendering software. Throughout the process, you can view your custom exhibit before it’s manufactured, giving you the opportunity to provide input, feedback, and suggestions to optimize and improve its design. Once you’ve approved our design, our experienced manufacturing team can turn it into a real custom exhibit for your next trade show. When the day of your trade show, convention, or expo finally arrives, our team will bring it to your event space and assemble it for you. All you need to do is show up ready to pitch and make sales! Interested in a custom trade show exhibit but don’t know where to start? That’s why we’re here! Finding inspiration and applying it realistically to your display can be one of the most challenging steps in preparing for a trade show, especially if you’re exhibiting at an event for the first time. 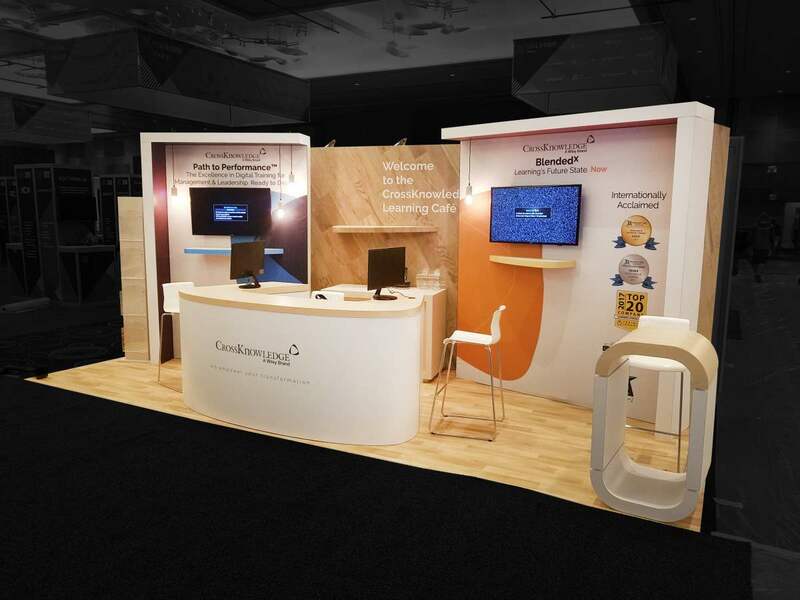 We’ve been in this business for over thirty years, so booth design has become second nature! Our experienced team has helped hundreds of businesses successfully exhibit at trade shows, from growth-focused startups to well-known brands. If you’d like to exhibit but don’t know where to start, we can help by providing actionable, effective custom trade show exhibit design ideas. From generating buzz to closing deals, our approach is simple: to take your goals into account and prepare an exhibit concept that helps you achieve them. Once you’ve chosen a concept, our experienced design and manufacturing teams can turn it into a reality. Our team can manufacture custom trade show exhibits with a range of layouts, dimensions, and floor plans. 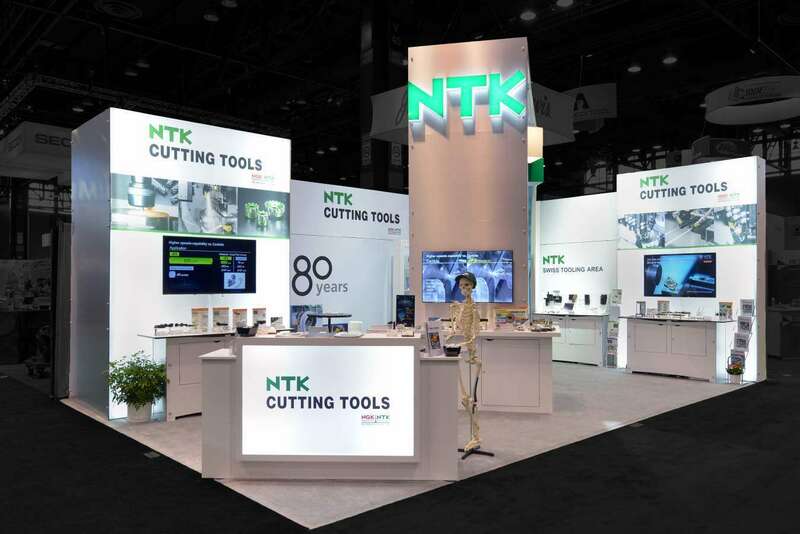 From small 10’x10’ booths to expansive custom exhibits, we’re here to turn your design ideas into a reality, no matter what your brand and budget requires. We can also prioritize certain characteristics to create a custom exhibit that perfectly matches your requirements. From portability to simple assembly and disassembly, our booths are designed with convenience and effectiveness in mind. 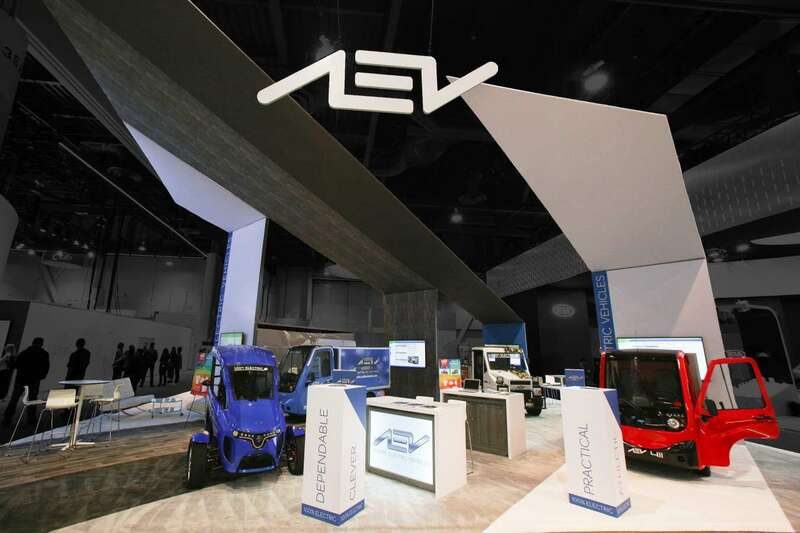 Whether you need a highly portable compact exhibit or the ultimate exhibit, we’re here to turn your design into a high quality, durable, and reliable trade show exhibit that lets your business achieve its goals. We take pride in our refusal to slap you with hidden fees, which, unfortunately, can be a common practice among rental companies. With us, what you see is what you pay for. Interested in talking to our manufacturing team? From quotations to advice and assistance, we’re here to help. For more information on our services, real examples of our work or any questions about our services, contact us at 1-800-451-4723 or via our contact page. Not quite ready to design and build your own custom exhibit? We offer rental trade show booths that can be customized to suit your needs — an affordable and convenient option if you’re taking part in a trade show for the first time. Our experienced team can also assist with every aspect of preparing for and taking part in any trade show. We will take of everything: transportation of your custom trade show exhibit to the event location, as well as construction, assembly and setup, disassembly, on-site event supervision, project management, and more. For more information on our additional trade show services, please visit our services page.